—James Hansen, Director of the Program on Climate Science, Awareness and Solutions at Columbia University’s Earth Institute, author of Storms of My Grandchildren: The Truth About the Coming Climate Catastrophe and Our Last Chance to Save Humanity. —Brian Czech, President, Center for the Advancement of the Steady State Economy, author of Shoveling Fuel for a Runaway Train and Supply Shock: Economic Growth at the Crossroads and the Steady State Solution. 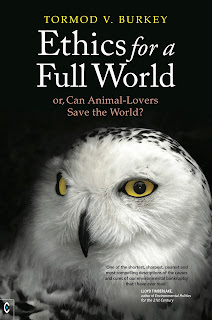 Ethics for a Full World or, Can Animal-Lovers Save the World?